In March, California and NRG agreed to settle a decade-old lawsuit by having NRG build a large electric car charging network in California, and while ECOtality raised objections attempting to stop the deal, those objections have met with rejection, allowing eVgo to begin its expansion into California. The expansion of the eVgo electric car charging station network into California is now free to proceed, thanks to a ruling announced on Monday by the Federal Energy Regulatory Commission. The eVgo expansion into California became reality with a settlement announced last spring concerning lawsuits over long term power contracts during the California Energy Crisis 10+ years ago. In exchange for dropping the lawsuit, NRG has agreed to build a large electric car charging station network, but the proposed settlement met with legal opposition from ECOtality, and the FERC had to approve the settlement. The settlement between the CPUC and NRG, announced last March, is a $120 million deal in which NRG makes a $20 million payment to the CPUC, and then additionally makes a $100 million investment in bringing eVgo to California by building a network of over 200 fast charging stations, and over 10,000 level 2 charging stations, across California's four major metropolitan areas. The primary opposition to the settlement was ECOtality, one of the existing electric car charging station network operators. ECOtality filed motions with the CPUC and with the FERC seeking to block the settlement, and in late May filed a lawsuit calling the settlement illegal. 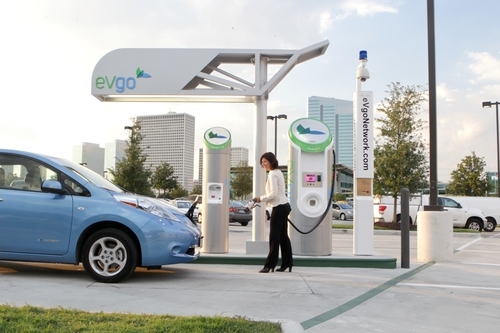 The thrust of ECOtality's claims is that the settlement is anti-competitive because it supposedly gives NRG's eVgo a subsidized entry into California's electric car charging market. The CarCharging Group also filed a motion with the FERC making similar claims. NRG disputed those claims saying that the CPUC had every bit of authority, and that ECOtality had failed to prove the settlement violated state law; that the money was not a diversion of ratepayer funds; that the CPUC had reached similar agreements in the past where the repayment was in the form of a business building a large project that served California's common good; that the settlement gave no preferential position for eVgo; that ECOtality also receives government subsidies for The EV Project; and that contrary to ECOtality's assertions, the settlement will enhance future competition in the electric car charging station market. In October, Ecotality lost its lawsuit in California which would have blocked the settlement. The FERC ruling had to first consider whether ECOtality and the CarCharging Group could even intervene in FERC's consideration of the settlement. This is a 10 year old case in which neither ECOtality nor CarCharging Group are legal parties in the case, and the deadline to raising objections in the case passed about 10 years ago. ECOtality and CarCharging both contended that their objections had to be considered because the nature of the settlement brought them into the case, due to the effect they claim the settlement has on their business. However the FERC denied their entry into the case noting that while both companies raised interesting points, even if the FERC were to hear those arguments, the FERC would still have approved the settlement. The FERC noted that the expansion of eVgo into California does not prevent similar investments by other companies; and that the injury ECOtality and CarCharging claim they will suffer is speculative. The clearing of the legal hurdles now starts the clock ticking on the five year time-frame in which NRG/eVgo will build out the charging station network in California. The scale of this charging station network is big, and will add considerably to California's electric car charging infrastructure. The investment dollars split into two large chunks: $55 million for fast charging infrastructure, $40 million for level 2 charging in multi-unit dwellings and businesses.